Over two years ago, a classmate from high school sent me a FB message asking for advice about Bangkok; she was looking at teaching at an international school there. A year later, I messaged her to tell her that she inspired me to pursue my own dream of traveling abroad. And a year after that, we reunited in Singapore, where her and her fiancé have been living for the past two years! That's how I came to stay with Tessa and Kevin for five days, high school classmates that I hadn't seen or really talked to in over 8 years. Which is why I'm convinced that travel actually makes the world a smaller place! To be honest, if I hadn't been meeting up with Tessa, I probably would stayed in Singapore for one night just to "check it off" my list. I didn't know a lot about the country and I had heard that it was really expensive. Plus, most backpackers roll their eyes at major cities because they have big egos and think they always have to get off the beaten track. But I am so glad I didn't skip this city because I honestly think it is my favorite city right behind Barcelona. Crazy, right? But here's the thing: Singapore is a really, really cool city. And it's a country at the same time! Even crazier. 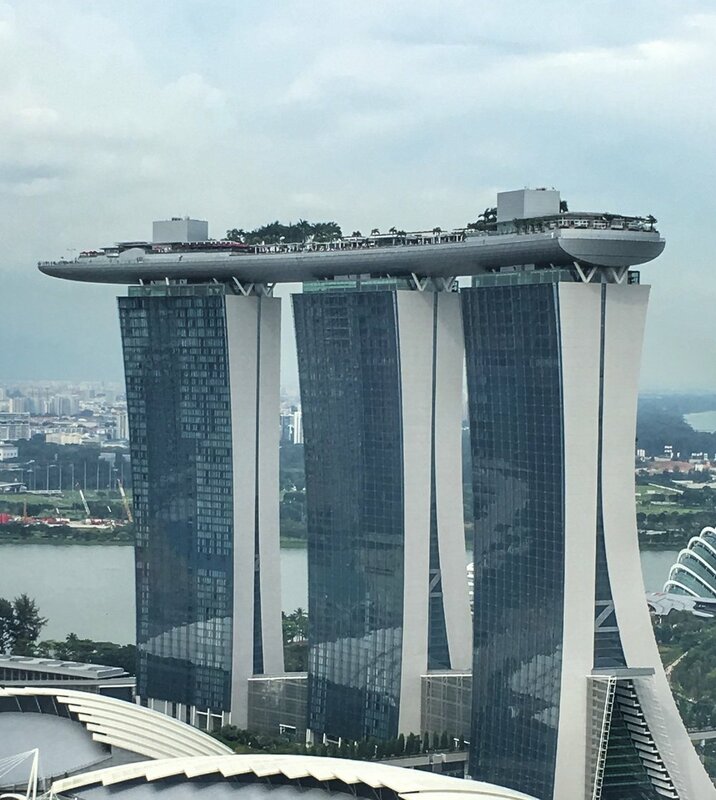 The iconic Marina Bay Sands building. At first, I thought Singapore was just cool because I had Tessa and Kevin to show me around their expat city, take me to their favorite restaurants, and help me with Singapore's mass transit line (the MRT). But the more I explored Singapore on my own, the more I came to really like and enjoy the country for myself. Honestly, what's not to like about Singapore? It's clean and efficient, the trains always run on time, and it's got amazing food, friendly locals, distinct neighborhoods, perfect photo ops, and a stunning skyline to boot. One of the things I loved about Singapore was its distinct mix of cultures; the country is a melting pot much like the US. Chinese are the majority, followed by Malays and Indians. I explored a Buddhist temple, Hindu temple, and a mosque all on the same street. 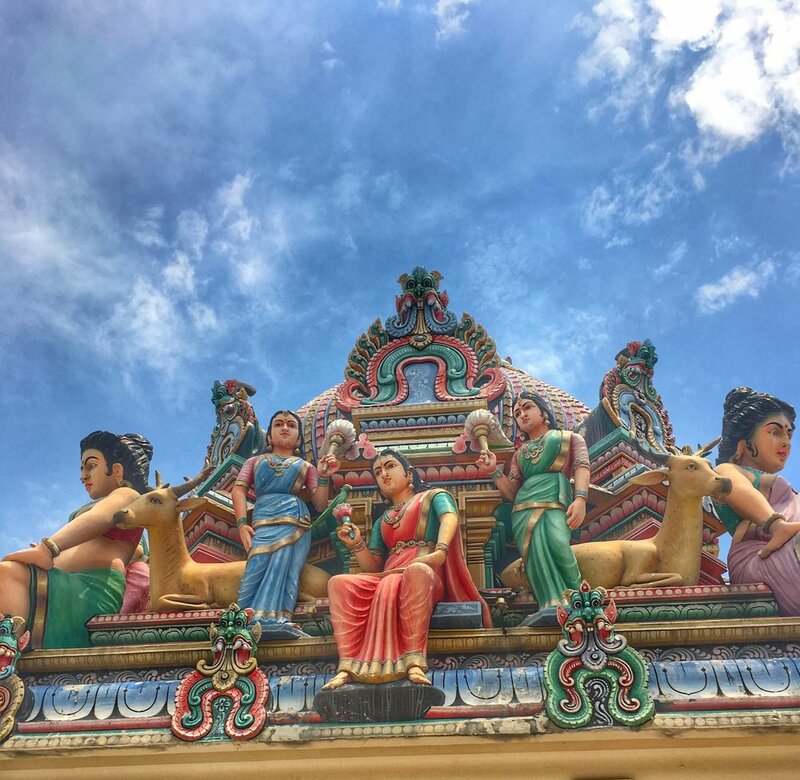 I wandered through street stalls and food markets in Little India, Chinatown, and Arab Street. I passed Indians in colorful saris and Muslims in stylish hijabs. Everywhere I looked, I seemed to be experiencing cultures much different from mine. Kevin and Tessa took me to Chinatown the night I arrived and we had amazing Chinese food at a spot called Noodle Man (yes, Noodle Man makes all the noodles there!). The next day, I went back to Chinatown while Tessa and Kevin were at work so that I could explore temple after temple. 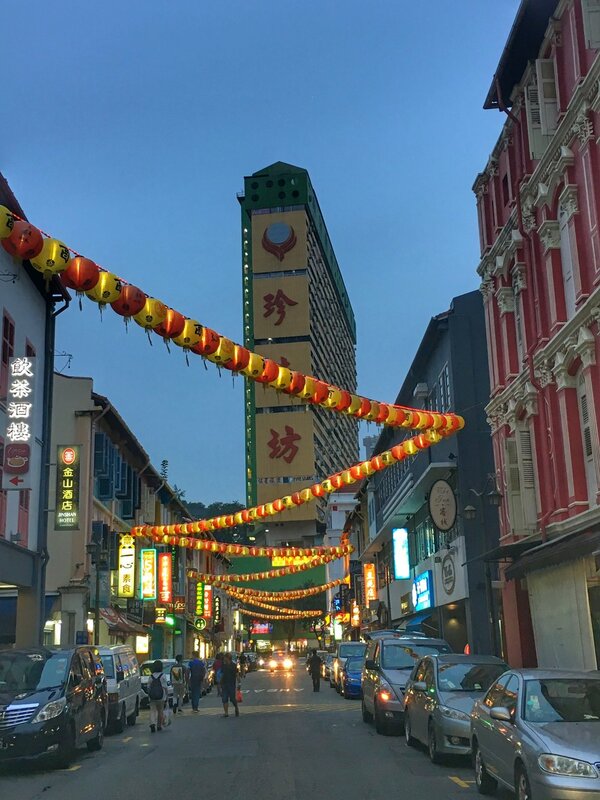 On Friday evening, we walked through the city, crossing through Arab Street, walking past mosques, and stopping to look at all the pretty fabrics. The Sultan Mosque on Arab Street. Tessa and Kevin took me to one of their favorite spots, SushiAirways, and even though I hadn't been the biggest fan of sushi in the past, I loved the sushi there. Plus, the restaurant was themed like an airplane! How cool is that?! Finally, we ended up at an Indian restaurant on the river. I had never even had Indian food, but quickly came to love it. 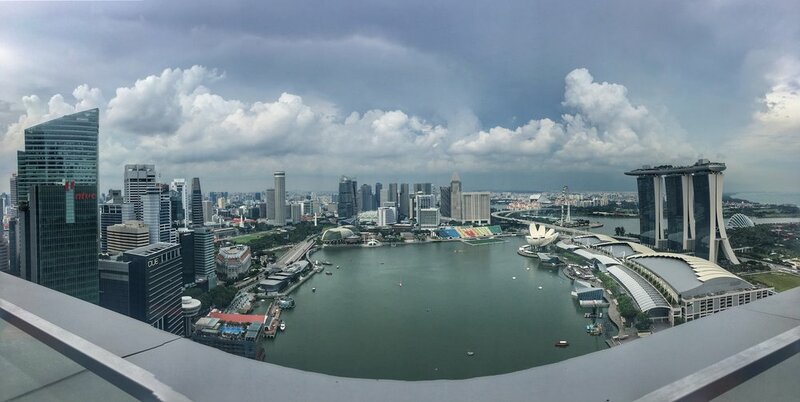 Singapore was like a crash course in Asia, and it couldn't have come at a better time. 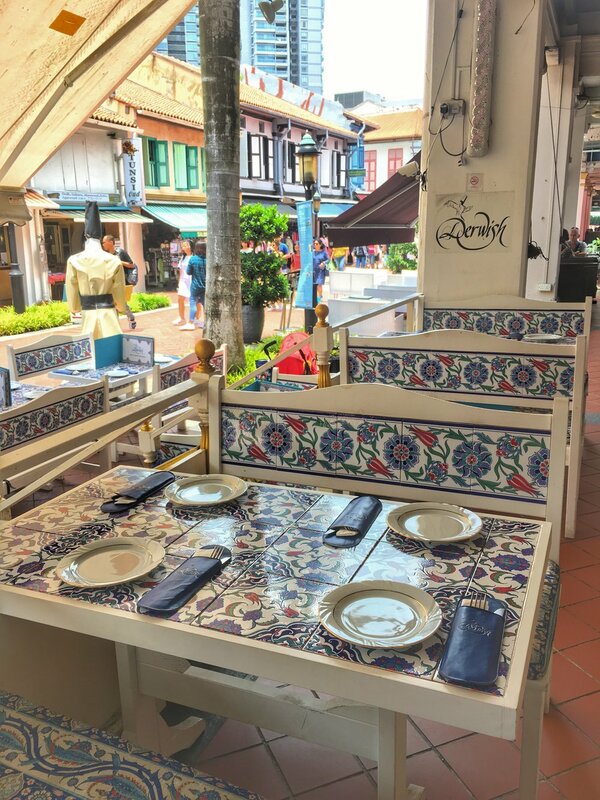 One of my favorite moments in Singapore was when I doubled back to Arab Street on a Sunday afternoon. The mosque I wanted to see was closed to visitors, so I ended up wandering in and out of small shops. I found a bookstore that sold adorable children's books and had a great conversation with an Arab shopkeeper who was excited to learn I was from Chicago. 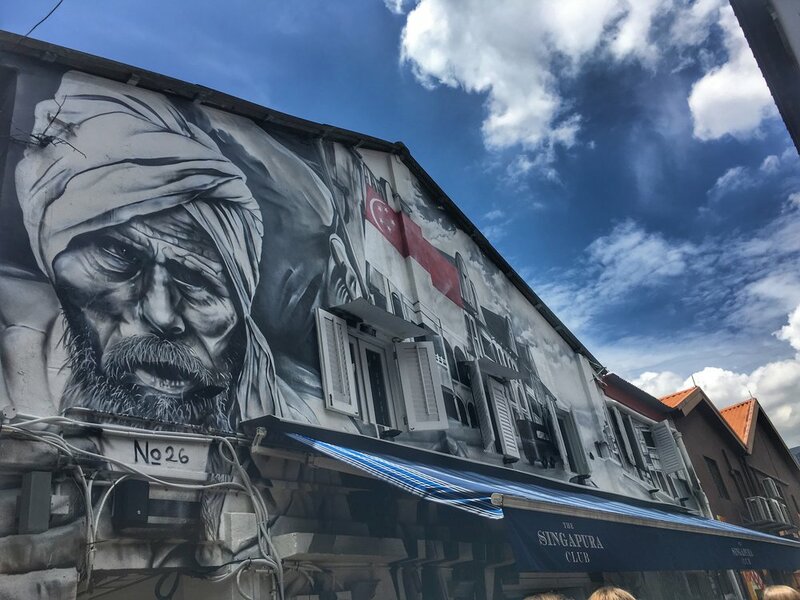 I eventually found myself in a narrow alley with amazing street art, and had incidentally stumbled upon Haji Lane, hands down my new favorite spot in Singapore. I loved the close quarters of the cafes, the hipster shops squished between neighborhood pubs, the street art that not only decorated the sides of walls but also the shutters above the storefronts. There were a lot of tourists crowding the streets with their selfie sticks, so I would have loved to have been there early in the morning when the shops were just opening and there was a light, morning glow. I'll remember that for next time. But then there's also the expat community! Singapore has a population of 5.5 million people and I was surprised to learn that 40% of those people are actually foreigners, or expats -- that's nearly 2 million people! An unexpected highlight from Singapore was that Tessa and Kevin showed me this other way to travel abroad: live abroad. The two of them have built their own life in Singapore, with great friends, a cozy apartment, good jobs, a grocery shopping routine, their favorite restaurant spots, and the ability to travel on the weekend (it's totally normal to start a story with, "When we were in Bali last weekend…"). I had never seen this side of travel before, specifically living long-term in another country and making it work. And then I started thinking, Well, what about living abroad? What does that process look like? What kind of jobs could I get abroad? My high school classmates were doing it, and my cousin is also teaching abroad in Vietnam, so why couldn’t I? Who knows what could happen, but the seed has been planted, and that's usually how all my crazy dreams turn into goals which turn into reality. The craziest thing about the weekend though? Two other high school classmates came to visit the night before I left SG! Kyle and Ben had found a cheap flight from Chicago to SG and were visiting Kevin and Tessa, too. Our visits happened to overlap for one night, which led to some very surreal moments. At a hawker center in the middle of Singapore. On Sunday evening, we started out with drinks at leVel 33, a craft brewery that overlooks the Singapore skyline and its infamous Marina Bay Sands (which we debated either looked like an airplane, a train, or a UFO). David and Aani, who were friends with Kevin and Tessa, also joined us which made for a really fun group. Not wanting to go home yet, we stopped at a hawker across from the apartment and settled in for more beers and more food. We made friends with Indians (but seriously, I'm actually Facebook friends with Arockiasamymartin Arockiasamymartin now) and Tessa has selfies with them to prove it. We ate enough cheese roti prata to roll ourselves home, and were lucky enough to be crashing another night with Tessa, Kevin, and an incredible apartment view. The whole night we kept saying, "Can you believe this? Would you have ever thought that we'd all be drinking Tiger beer and eating roti prata at a hawker in Singapore?" Uh, no. I hadn't seen these people in eight years, and even in high school we ran with different circles of friends. But here we were, in the same city, 9,300 miles from home, having the time of our lives. A love for travel can make some amazing things happen. The view from Kevin and Tessa's apartment. Unreal. Singapore was a welcomed break. I didn't live like a backpacker (which you'll definitely see when I add my costs up in this month's recap), but that was the whole point of having enough money saved up. If a fun weekend like this came up, my budget wouldn't have to be an issue. It was fun to buy a few beers, eat at sit-down restaurants, and throw caution (money?) to the wind. But it's true that Singapore is expensive, especially with no income, so four days was about all I could manage. And while it would have been all too easy to stay, I had to go. I had a flight to Kuala Lumpur, Malaysia and a lot more places to see. I had no idea what to expect coming to Singapore, but I certainly didn't expect to love the city so quickly or to be a part of an impromptu mini-high school reunion. Having a blast in Singapore made me even more excited to jumpstart the Southeast Asia part of my trip, and being with friends from home made me feel just a little bit closer to Valpo for a few evenings. I really don't think there's anything better than that. Accommodation: Big thank you to Kevin and Tessa for hosting me in their beautiful apartment for four nights. How to get there: By plane or you can also the cross the border from Malaysia. If I'm being honest: Don't skip Singapore if your budget allows it. It's worth more than an airport stopover (but Singapore's airport is consistently ranked the best airport in the world, no surprise there).